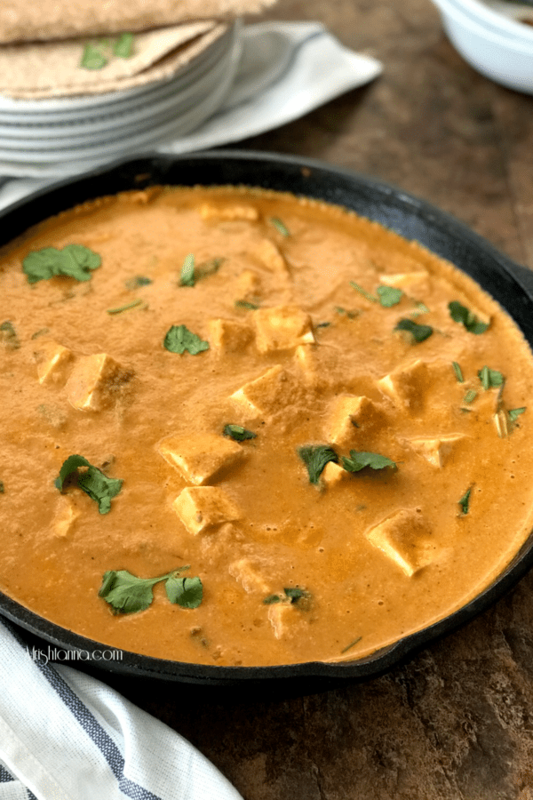 Here’s a recipe for Tofu Butter Masala! 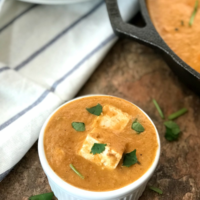 Every time you pay for Paneer Butter Masala at an Indian restaurant, try to remember that there is a vegan version that is easier, healthier and one that you can prepare in 30-35 mins flat. This is in response to reader requests for vegan versions of common dishes. Keep the request coming as it keeps me challenged to find vegan ways of preparing common recipes! Paneer Butter Masala is one of the popular and common curries you can order in restaurants. It is a traditional Indian recipe in which soft pieces of Paneer are cooked in rich creamy butter & tomato gravy. It goes by various names like Butter Paneer, Paneer Makhani, etc. 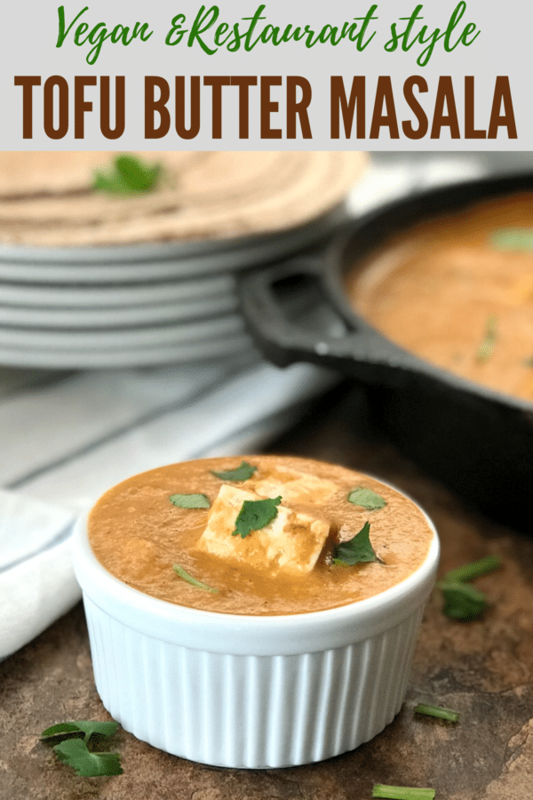 What is Tofu Butter Masala? 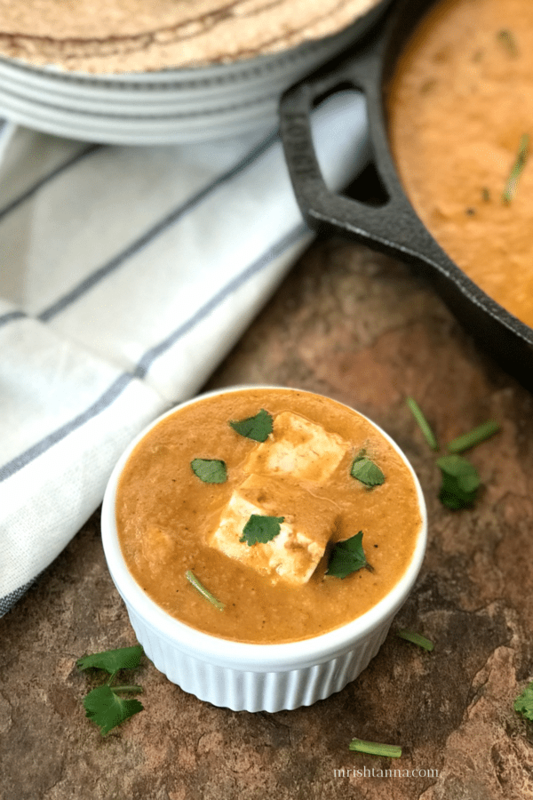 Tofu butter masala is nothing but a vegan version of paneer butter masala. My vegan version features Tofu simmered in a flavorful tomato and spice base. The best way to serve up this is to pair them with Naan Roti or Paratha or even steamed rice. With a little prep work ahead of time, this recipe can be completed in 30-35 minutes. The prep work is not too complicated either. Just soak in cashews in warm water for an hour and you are good to go! If this recipe interests you or tried by you comment me below. For more delicious vegan recipes such as this sent directly to your inbox, just subscribe to my newsletter. You will also get a copy of my e-book where I have put together some simple vegan dessert recipes and dessert essentials. My readers have found it very helpful and I am hoping you will too! Here are the recipe details! 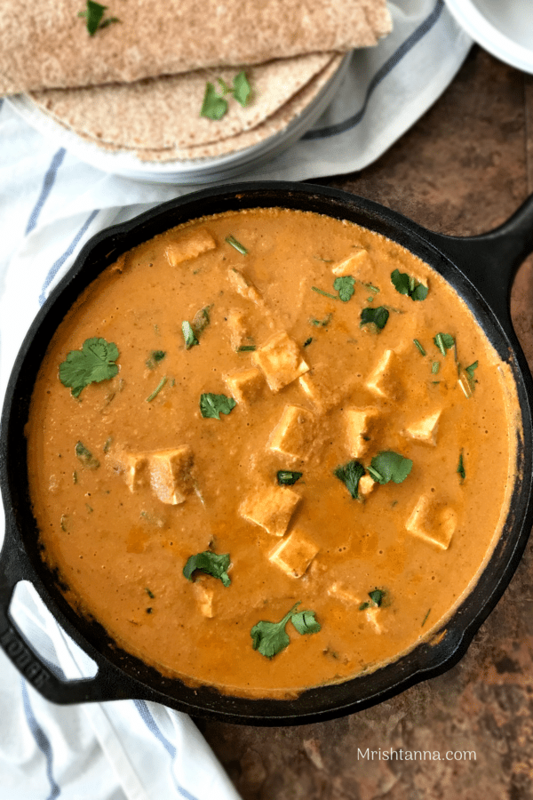 Tofu butter masala is nothing but a vegan version of paneer butter masala. My vegan version features Tofu simmered in a flavorful tomato and spice base. Place a large pan over medium heat and add 1 tbsp vegan butter. As the butter melts, add onion and fry till they turn translucent. Add tomatoes and cook them until they are soft. Switch off the heat and add the soaked cashews. When it has completely cooled down, blend into a smooth gravy. Place same or different pan over medium heat add 1 tbsp vegan butter and saute bay leaves, cloves, and cardamom for 20 sec. Add ginger, garlic paste and saute until the raw odor disappears. Now, add the tofu cubes and fenugreek leaves. Cook for 3 more mins. When it starts to boil, switch off the heat and garnish with cilantro and more vegan cream. Serve with Naan, Paratha or steamed rice. Tofu Butter Masala is ready for your table! Serve hot with your favorite pairings!